We are Manufacturer, Supplier of The Self Aligning Types:- Model 'SARI-SERIES and our setup is situated in Pune, Maharashtra, India. Self Aligning Rotators automatically adjust the Roller Housings to accept any job diameters within specified diameter range. 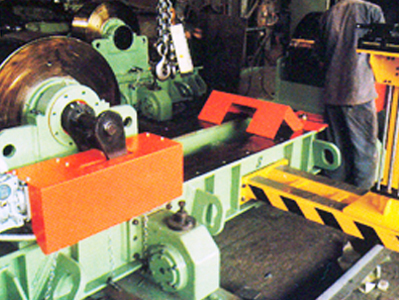 This type of machines are generally used to cope with the change in shell diameter, job to job. 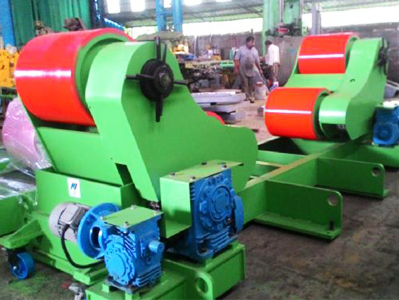 The roller housings of this type of machine are hinged to the beds and open automatically when larger diameter job is introduced. In this type of rotator, each roller bracket assembly has two separate roller assemblies, and thus supports the job on wider area. The final drive is given to both the 2-sets of rollers of the Drive Unit, provide better traction to the job. However, in this case a declutching arrangement is provided to the top rollers, in order to protect the gear boxes, as when the job hits the top rollers first while loading, there is a tendency of rotating the top rollers where as it is locked by the gear boxes. During C - seam welding of shell sections on rotators, axial movement of shell or shell drifting invariably takes place. This drifting cannot be avoided. Reasons for this drifting could be geometrical inaccuracies of • individual shells, inaccuracies of drive unit and idler unit alignment, etc. Even if the drive unit and idler units are aligned with each other initially, .11 during shell loading, the alignment tends to get disturbed. In lighter "AA shells, this drifting can be stopped by positive stoppers. However in heavier shells, due to axial drifting, tremendous pressure will get generated and this pressure will come on the positive stopper, if provided, and will break it. Ideal solution is to prevent this happening, to avoid creating such situation. This is achieved through anti-drifting arrangement. In this case also, drifting will take place which cannot be avoided. But the movement will be restricted within a band of "+ / - 5 mm". Seam will keep floating forward and backward within this range.